In June 2010 I was in London talking to an official of the Bank of England. We were discussing a chart that projected GDP for the UK economy over the ensuing two years. It also happened to retrace the history of GDP since 2006 depicting the scale of the economic decline that marked the onset of the crisis. The chart, a “fan chart,” is unusual insofar as it portrays graphically a probabilistic forecast of GDP with darker bands representing the more likely central projections of GDP and lighter bands representing statistically less likely outcomes. Central banks are proud of their fan charts because they communicate transparently how their policy stance is intended to influence the economic activity over time as well as the limitations inherent in the forecasting exercise. That said, it was hard not be impressed with how this simple chart summarized the course of an astoundingly complex historical event. We were discussing the uncertainties about evaluating recovery in the UK going forward when my interlocutor made a small observation about the chart. He noted that the fan chart projected backwards, that is it also depicted the past and present probabilistically. 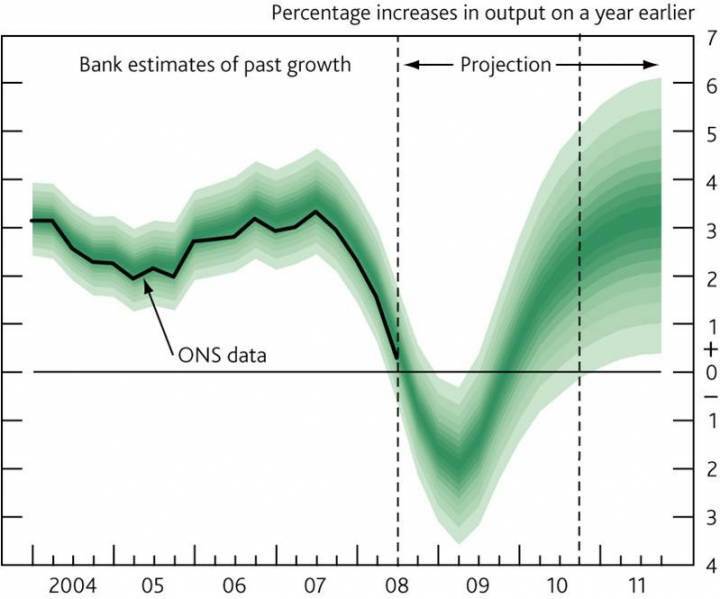 In other words, the scale of the downturn and the then current state of the UK recovery were far from clear in June 2010 and both could only be expressed probabilistically. The dimensions of the crisis we were living through were, thus, only understood imprecisely. Representations of the economy—despite our obsessions with rendering them in exact mathematical terms—are fragile cultural constructions. My interlocutor’s aside reminded me that an anthropological question resided in this chart, one that animated my research. He reminded me that the personnel of central banks while seeking to address pragmatic issues of monetary policy were engaged in a deep anthropology, a deep engagement with the representational forms—the models—that mediate our economic predicaments (Riles 2004). The central bankers I study are preoccupied with monetary policy, the regulation of money and credit to the banking system. They are acutely aware of how uncertainty impinges on every aspect of their work. Their colleagues, who work in the financial stability divisions, are the figures centrally concerned with systemic risk. In the midst of the financial tumult that commenced in September 2008, these two central bank operations increasingly converged. The definition of “systemic risk” outlined in Wikipedia provides a good starting point: “It refers to the risks imposed by interlinkages and interdependencies in a system or market, where the failure of a single entity or cluster of entities can cause a cascading failure, which could potentially bankrupt or bring down the entire system or market” (http://en.wikipedia.org/wiki/Systemic_risk, accessed November 20, 2010). Frank Knight formulated the classic distinction between risk and uncertainty. Here is Knight’s delineation of the two concepts. Uncertainty must be taken in a sense radically distinct from the familiar notion of Risk, from which it has never been properly separated…. The essential fact is that ‘risk’ means in some cases a quantity susceptible of measurement, while at other times it is something distinctly not of this character; and there are far-reaching and crucial differences in the bearings of the phenomena depending on which of the two is really present and operating…. It will appear that a measurable uncertainty, or ‘risk’ proper, as we shall use the term, is so far different from an unmeasurable one that it is not in effect an uncertainty at all (Knight 1921:19-20). The practical difference between the two categories, risk and uncertainty, is that the former the distribution of the outcome in a group of instances is known (either through calculation a priori or from statistics of pas experience), while in the case of uncertainty this is not true, the reason being in general that it is impossible to form a group of instances, because the situation dealt with is in a high degree unique (Knight 1921: 233). Life is mostly made up of uncertainties, and the conditions under which an error or loss in one case may be compensated by other cases are bafflingly complex. We can only say that “in so far as” one confronts a situation involving uncertainty and deals with it on its merits as an isolated case, it is a matter of practical indifference whether the uncertainty is measurable or not (Knight 1921: 235). The efforts to erase this distinction created the intellectual foundations for the current financial crisis. In a remarkable, unpublished paper by Stephen Nelson and Peter Katzenstein entitled, “Uncertainty and Risk and the Crisis of 2008,” the authors trace out how rationalist approaches in economics—deeply committed to sophisticated mathematical modeling—sought to treat uncertainty as a species of calculable risk. They note that John von Neumann and Oskar Morgenstern (1947) provided economists with a sophisticated means to model rational choice under conditions of risk and how this agenda transformed the discipline over the subsequent half century. I cannot do full justice to their account herein; it is intricate and persuasive analysis demonstrating how uncertainty was increasingly treated by academics as calculable risk and why this was so compelling to economists and to bankers. What they further demonstrate is how this profound intellectual error punctuated just about every aspect of crisis that we are currently living through. Donald Mackenzie examines in An Engine, Not a Camera: How Financial Models Shape Markets these issues in relation to the Black-Scholes-Merton equation. Basically the same maneuver of relentlessly quantifying risk while eliminating uncertainty was, as he demonstrates, at the center of Long-Term Capital’s debacle presaging many aspects of the current crisis providing vectors of contagion across the financial system. Here is where the story becomes particularly vertiginous. Economists believed during the last half of the twentieth century that they were embarked on an enterprise to make economics increasingly precise, predictive, and, thus, scientific. The value of their methodological innovations, modeled on physics, is of course open to debate (MacKenzie 2001; Samuelson 1947). What economists did succeed at and what is not debatable is that they created a “performative” regime by which their ideas, their theories, their models were assimilated by experts (as if they were true and valid) and designed into the intellectual structure of contemporary institutions. Economic ideas were put at the service of making reality not merely represented it analytically. Michel Callon…proposed elucidating explicitly the performative character of economics; that is, he proposes considering economics not as a form of knowledge that depicts an already existing state of affairs but as a set of instruments and practices that contribute to the construction of economic settings, actors, and institutions…. (MacKenzie, Muniesa, & Siu 2007: 3-4). Thus, treating uncertainty, as calculable risk was not a matter of a flawed academic exercise or experiment, rather as these assumptions were engineered directly into the models employed to manage and to regulate the system, they themselves became the sources of contagion and the motors of systemic risk. In other words, it was not merely that academics got the story wrong, not merely that their formal analytical models were responsible for grotesque misrepresentations of workings of markets; rather, it was how these models came to be built into the working of the financial system—secreted deep in its regulatory frameworks—and, thus, how these ideas became fully implicated in the ensuing destructive storm (Riles 2001, 2010). The other great theorist of uncertainty is, of course, J. M. Keynes, who stated his position in a famous, lyrical passage in the General Theory of Employment, Interest, and Money. We have now introduced money into our causal nexus for the first time, and we are able to catch a first glimpse of the way in which changes in the quantity of money work their way into the economic system. If, however, we are tempted to assert that money is the drink which stimulates the system to activity, we must remind ourselves that there may be several slips between the cup and the lip. For whilst an increase in the quantity of money may be expected, ceteris paribus, to reduce the rate of interest, this will not happen if the liquidity-preferences of the public are increasing more than the quantity of money; and whilst a decline in the rate of interest may be expected, ceteris paribus, to increase the volume of investment, this will not happen if the schedule of the marginal efficiency of capital is falling more rapidly than the rate of interest; and whilst an increase in the volume of investment may be expected, ceteris paribus, to increase employment, this may not happen if the propensity to consume is falling off. Finally, if employment increases, prices will rise in a degree partly governed by the shapes of the physical supply functions, and partly by the liability of the wage-unit to rise in terms of money. And when output has increased and prices have risen, the effect of this on liquidity-preference will be to increase the quantity of money necessary to maintain a given rate of interest (Keynes 2007: 155). For Keynes, the economy operated in our world, where ceteris paribus does not necessarily obtain, where the rational and the irrational co-exist or may be entirely inseparable, where knowledge is imperfect, and where information is asymmetrical, and experience and intuition can or must inform judgment (Holmes 2009, Zaloom 2004). The shifting and fugitive dynamics of global markets, their operation from innumerable perspectives is made available to us through the inter-mediation of language, through agile linguistic scenarios that are susceptible to continuous modification and elaboration (Lakoff and Johnson 1980; McCloskey 1985, 1990, 1994; Smart 1999, 2006). Keynes’s evocative accounts yielded an analytical tableau—in many respects congruent with an ethnographic framework—to be communicated to a public, an elite public of politicians, bankers, academics, businessmen, and journalists who populated his analytic landscape thus making its features susceptible to policy interventions, to persuasion. Uncertainty had to be addressed at every turn, calculable risk was elusive and capricious. The possibilities and limitations of economic method and theory were predicated on particular historical circumstances. Keynes insinuated on to this landscape protagonists capable of thinking and acting critically within and upon the then contemporary world. Keynes sought not merely to debate, to persuade, and to otherwise influence these subjects, but learn from them. “The economist’s task was to discern the form or style suitable to the age—a matter of aesthetics and logic…Keynes always stressed the crucial importance of “vigilant observations” for successful theory-construction—theory being nothing more, in this view, than stylized reorientation of the dominant tendencies of the time, derived from reflection on the salient facts” (Skidelsky 1992:221). I have developed the notion of an “economy of words” to encompass the means for modeling linguistically and, hence, communicatively economic phenomena operating at the limits of calculation and measurement (Holmes 2009). In this economy “at large” or “in the wild,” as Michel Callon (2007) describes it, words perform the decisive function of creating context—countless contexts—that frame data series, statistical measures, and econometric projections. The shifting and fugitive dynamics of global markets, their operation from innumerable perspectives is made available to us through the inter-mediation of language, through agile linguistic scenarios that are susceptible to continuous modification and elaboration. The narrative practices pursued by central bankers are by no means indifferent or antagonistic to the realm of numbers, far from it; in the first instance they are shaped by the analytical predicaments posed by various forms of statistical measurement and quantitative analysis. Indeed, words are continually employed to scrutinize the nature of economic categories and the vagaries of statistical measurement (Blinder et al 2001). In my broader project I argue that through the construction of acute “econometric scenarios” central bankers create the economy itself as a communicative field and empirical fact. At every turn these scenarios are underwritten by uncertainties that encompass incalculable risks. [i] The discussion that forms the second part of this essay was developed initially in longer piece entitled, “Economy of words” (Holmes 2009). Blinder, Alan S., Charles Goodhart, Philipp Hidebrand, David Lipton, and Charles Wyplosz 2001 “How Do Central Banks Talk?” Geneva Report on the World Economy, 3. Geneva: International Center for Monetary and Banking Studies. Callon, Michel 2007 “Performative Economics.” In Do Economists Make Markets? Donald MacKenzie, Fabian Muniesa, and Lucia Siu, eds. Pp. 311–357. Princeton: Princeton University Press. Holmes, Douglas R. 2009 Economy of words, Cultural Anthropology. 24:381-419. Nelson, Stephan and Peter Katzenstein nd Uncertainty and Risk and the Crisis of 2008. Unpublished ms.
Knight, F.H. 1921 Risk, Uncertainty, and Profit. Boston, MA: Houghton Mifflin Company. Keynes, John Maynard 2007  The General Theory of Employment, Interest and Money. The Royal Economic Society. Basingstoke, UK: Palgrave. Lakoff, George and Mark Johnson 1980 The Metaphors We Live By. Chicago: University of Chicago Press. MacKenzie, Donald 2001 Physics and Finance: S-Terms and Modern Finance as a Topic for Science Studies. Science, Technology and Human Values 26(2):115–144. MacKenzie, Donald 2006 An Engine, Not a Camera: How Financial Models Shape Markets. Cambridge, MA: MIT Press. MacKenzie, Donald, Fabian Muniesa, and Lucia Siu 2006 Introduction. In Do Economists Make Markets? Donald MacKenzie, Fabian Muniesa, and Lucia Siu, eds. Pp. 1–19. Princeton: Princeton University Press. McCloskey, Deidre 1985 The Rhetoric of Economics. Madison: University of Wisconsin Press. McCloskey, Deidre 1990 If You’re So Smart: The Narrative of Economic Expertise. Chicago: University of Chicago Press. McCloskey, Deidre 1994 Knowledge and Persuasion in Economics. Cambridge: Cambridge University Press. Riles, Annelise 2001 “Real-Time: Governing the Market After the Failure of Knowledge.” Paper presented at the University of California at Berkeley, Department of Anthropology, January 18. Riles, Annelise 2004 “Real Time: Unwinding Technocratic and Anthropological Knowledge.” American Ethnologist 31(3):392–405. Riles, Annelise 2010 Collateral Knowledge: Legal Reason in Global Financial Markets. Chicago: University of Chicago Press. Skidelsky, Robert 1992 John Maynard Keynes, vol. 2: The Economist as Savior 1920–1937. New York: Penguin. Smart, Graham 1999 “Storytelling in a Central Bank: The Role of Narrative in the Creation and Use of Economic Knowledge.” Journal of Business and Technical Communication 13:249–273. Smart, Graham 2006 Writing the Economy: Activity, Genre and Technology in the World of Banking. London: Equinox. Summers, Lawrence 1991 “The scientific illusion in empirical macroeconomics,” Scandinavian Journal of Economics, 93(2):129-148. Zaloom, Caitlin 2003 “Ambiguous Numbers: Trading Technologies and Interpretation in Financial Markets.” American Ethnologist 30:258–272.